This switch is powered throw port 5, by 802.3 af or 802.3 at. I want to use the port 3 and 4 for computers (no problem), and use port 1 to get back power in DC to provide power supply to an electric card. If the switch is powered by 802.3at (POE+), what is the current I can get on port 1 (on 48v DC) ? Is there some splitters to connect on port 1 to get directly DC power (48, 24 or 12v) ? 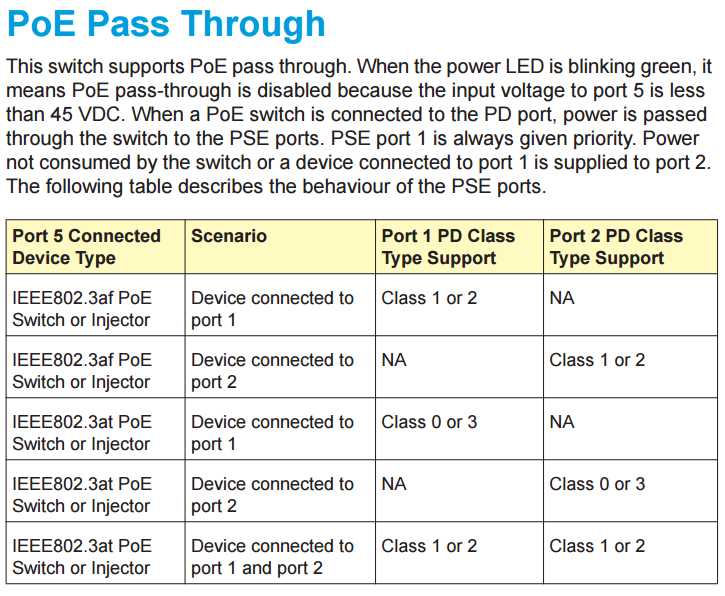 If the PoE pass-thru is enabled you should get 19W with 802.3at/7.9W with 802.3af input power.